ClamAV is an open source anti-virus program that can be run from the command line, making it incredibly useful for locating any viruses and malware on Linux based servers. Recently someone I’ve previously worked with reported that they’d had reports of abuse originating form one of their servers. Given the quantity of sites, it was difficult to locate any potential vulnerabilities. HP Microservers are a low cost, small form factor cube-sh PC that are great for using as media centres or NAS boxes. I’ve already got a few microservers running FreeNas or Ubuntu server providing shared network drives or running as mass-backup boxes. Since this microserver was broken and relatively low cost, my first action was to investigate what’d gone wrong with it. When connected to the mains, the server’s power button was constant amber. It didn’t respond to button presses and wouldn’t power up. I did some research and it suggested that the most likely reason for the amber light was a stuck power button. I pulled the power switch connector from the mother board and used a multimetre on continuity test mode to check each pin pair until I found one that connected when the button was pressed. This indicated that the power switch was working fine, as it would complete a circuit when held down, and disconnect when released. I shorted the matching pins on the mother board, effectively becoming the power switch and the server still didn’t boot, which confirmed that this was not the problem. Delving deeper, I started dismantling the microserver to see if I could work out what had gone wrong – sure enough a quick visual inspection found the CD drive SATA power connector was a melted mess, and scorch marks were on the metal frame. 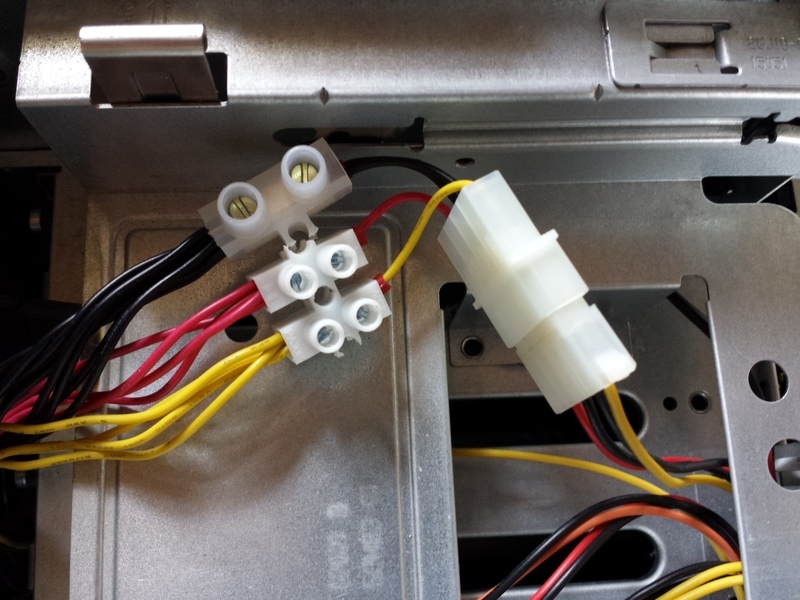 The CD drive was dead, pins on the molex to SATA adapter having shorted inside the plastic housing. I pulled the PSU and found it to be dead, it wouldn’t turn on when shorting the pins on the ATX header so a new power supply was in order. Since HP microserver power supplies are quite expensive (~70 GBP), I wanted to make sure the motherboard still worked before paying for a replacement PSU. I used an old ATX power supply which I had floating around and connected it to the microserver. It’d never fit inside the case, so I just left it hanging around next to the microserver. It booted off a memory stick fine, and that was proof enough for me that I needed a new power supply. I ended up finding this blog: http://chrisstark.co/2013/08/hp-microserver-n36-replacement-power-supply-psu/ which was someone in a similar position to me. They had a microserver which needed a new power supply, but found that LinITX had a similar replacement unit which was significantly cheaper than a genuine spare. LinITX is a fantastic site dedicated to embedded hardware and I’ve often browsed wishing I had enough cash to buy goodies from them. In this case, since the PSU was only £30 (GBP) I bought one straight away. This is a link to the PSU https://linitx.com/product/fsp-150w-1u-compact-power-supply-fsp15050gub/13062 and the quickfind code is FSP150-50GUB. All back-plane cables are grouped by colour into a chocbloc, then a female molex cable attached to the other side. With the PSU connected, the only problem I now had was the SATA backplane requires 4 molex power connectors and the PSU only has one. Since this is likely going to be a “toy” microserver due to the cost and not-properly-tested nature of it, instead of investing in molex splitters, I decided to hack off the existnig backplane molex cables, group the connectors into colours, strip the ends and solder them together. Once this was done I used standard electrical choc blocks to connect one end into a standard molex female that I’d cut off previously. It looks messy but is reasonably electrically sound. Now that’s done, I decided to have some fun. I’ve had an air brush for years and never properly gotten into it – mastering a skill takes time which I’ve never seemed to have. Plus it’s messy so you’ve got to have dedicated time to flush through cleaner when you’re done, and set up a dirty work area. 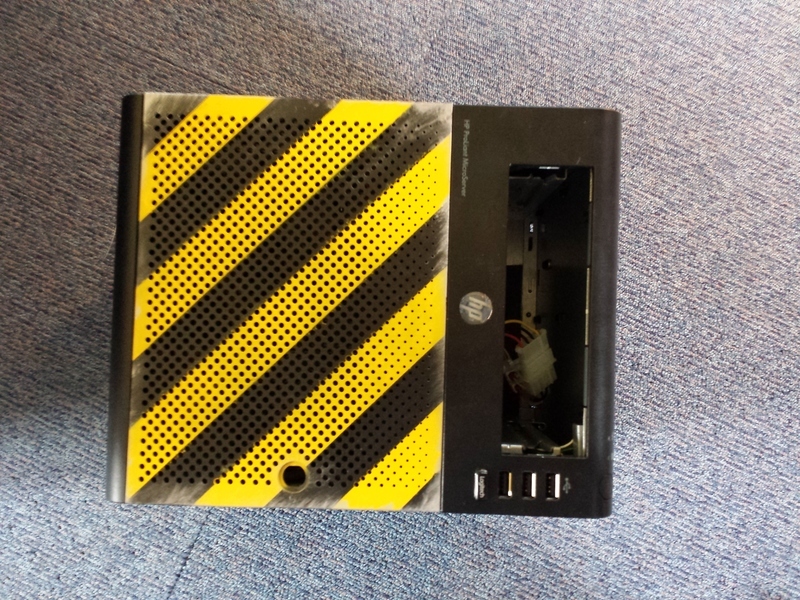 While tempted to companion cube my micro server I decided in the end to just do black and yellow hazard lines. First off, I opened the door and lifted it slightly to release it from the hinge. I was then able to use a pair of pliers to remove the locking mechanism’s nut on the inside of the door and put this to one side for safety. Once the lock is off (this can take some slight wiggling of the lock cylendar) I was able to unclip the plastic from the back metal frame. I only wanted to paint the plastic, and was worried there would be ghosting effects if I left the metal frame inside the door. I masked off the area using masking tape, following the lines of the air holes on the door. 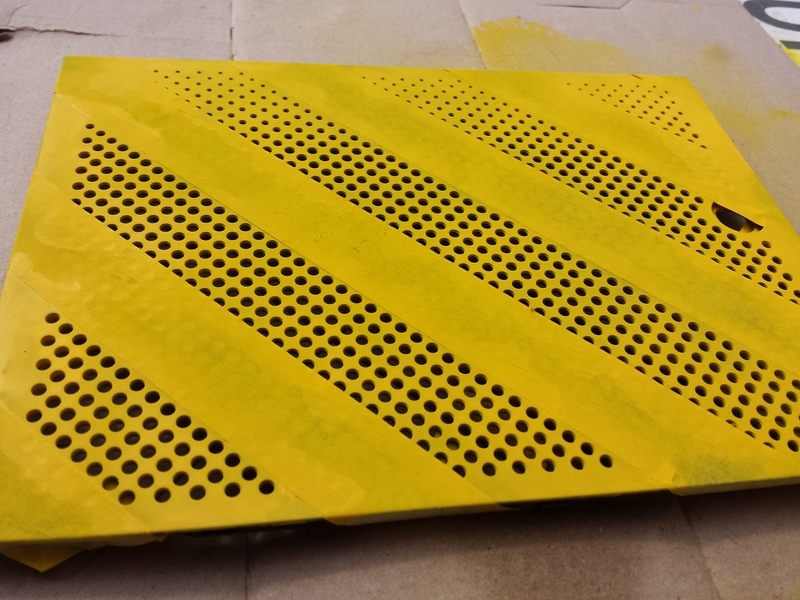 I mixed by yellow paint 50/50 with water and tried to evenly coat the door. That didn’t go so well. After 2 coats I gave up and instead removed the masking tape. I then got out some aluminium paint and dry-brushed the edges of the door to give it a weathered look. My method for dry-brushing, since I’d never done it before, was to get a little bit of paint onto a dry paint brush, dab it on my cardboard floor covering to thin it out, and then lightly brush the edges of the door. It actually came out really well – yes I am surprised by that! Finally I reassembled the server with the new door, power supply and hacked molex connector. I still have plans for what to do with the CD drive bay – possibly an LCD screen indicating IP address and drive status, I might replace the lock with a handle of some kind and I may paint the rest of the server. I also need to decide what to install on it! Almost there – Microserver with new PSU, hacked back-plane power connector and painted front door. We’re exposing our database architecture – people can see orders have fields “order_ref”, “recipient_id”, etc. Our index functions are using “all()”, so they get all results from the database. We’re not validating our data before adding it to the database. Transformers are often used in APIs to obscure and abstract the database later from the responses provided to users. What this means is we “transform” what our database record field names are, and turn them into something else. Say in our database we were storing a field “recipient_name”. Instead of the API returning this to the user on a get request, we could use a transformer to return a different field name “name” for example. This obscures our database architecture so we’re not giving away our field names. Additionally, the abstraction here means that if we change our database architecture we’re not relying on API users to change their tools or utilities as well. We can change the database field names without worrying about what users are doing. All we’re doing here is transforming our Database collection into an array and returning it. The left hand side of the array define the keys that will be used for the JSON response. The right hand side gets the variant fields from the database. What this empowers you to do is hide database fields – like created at – so there’s no risk they’ll be visible to the API. Only items in this array will be returned in API requests. The next key advantage is that the variant database field name doesn’t have to match the API field name. This means that if there’s a major database update that needs to take place, you can update the transformer and not have to ask customers to re-map everything in their APIs. // Return variants via the Variants Transformer. Now when you call the variants controller in postman, you should see array values coming through as keys in JSON, not database field names. Following this theme we need to update the Items controller, as well as creating an ItemsTransformer, and the orders controller along with an OrdersTransformer. Save all of your work, git commit it if you’re being safe (I won’t show you how to do that now, you know how by now!) and run php artisan serve in order to start the local webserver. Use Postman to send requests to see if your updates are working. One thing to note is that this only transforms the output of our database. Your incoming requests are not handled via the transformer. This is due to the design of fractal, and there is a discussion about it here if you’re interested. Instead of “transforming” input in this way, it’s suggested that models and validation are used instead. Next time we’ll look at running some validation on the input we’re sending to create new orders and order items, as well as working out how to apply the API architecture to the models. This is part 3 of the Laravel 5 & Dingo API series, in which we’re building an API to receive orders from 3rd parties and ship them to recipients. Last time we covered setting up the database, creating migrations and setting up models. This time we’re going to focus on Laravel’s controllers and how we get them working with Dingo API in order to create, read and update data stored in our database. I’m going to start with a variant controller as it has more information that can be returned with a get request and we wouldn’t allow 3rd parties accessing the API to create any variants. This makes it much simpler to build. This is simply inheriting the Controller class, then using the Helpers and creating a new BaseClass to extend from in our API. php artisan make:controller api\\ItemsController --resource # Controller created successfully. php artisan make:controller api\\OrdersController --resource # Controller created successfully. As part of the URL, we will pass the item ID, which allows us to do a database search for that item and return the response. If no item is found it’ll return an empty array. Have a play with the items controller and Postman to make sure your routes and actions are working as expected before moving on. These implementations are not perfect, but it’s enough to get started. Later we’ll see how we can perform validation and even use transformers to alter requests. The orders controller is going to be a duplicate of the items controller to begin with. All of the functionality we added into it we will add into this. Now is a good time to commit what we’ve done in git, before moving onto refactoring it. git add -A git commit -m "created items, orders and variants controllers with basic functionality"
git commit -m "created items, orders and variants controllers with basic functionality"
This is part 2 of the Laravel 5 & Dingo API series, in which we’re building an API to receive orders from 3rd parties and ship them to recipients. Last time we covered setting up the environment and making a test API call using Dingo API. This time around, we’ll be looking at what the database architecture could be like, and how we create it with migrations and setting up models with Eloquent ORM in Laravel to allow the API to access our database. As with most applications you’ll ever write or interact with, the database is key and it’s design and organisation will be wholly dependent on the application you’re crafting. Right now, I’m going to look at an order API. Lets ponder the database architecture for a moment. What information do we need to store in order to achieve an order API? ID our unique identifier for this order. recipient this is going to be an array of recipient address data. recipient_id the FK to the recipients table so we know who to post the order to. ID our unique identifier for this item. Laravel uses a feature called Migrations to create database schemas. This is fantastic when you’re working with multiple developers as you can architect the database in flat files and “migrate” changes each time you pull down a new version of the code base. It also makes it easier than writing out all of the database tables in SQL or using a tool like MySQL Workbench to create them. We’re going to use the power of the migrations in Laravel to create our API table layout.
. You’ll also note that there are some preexiting migrations for users and password resets. You’re welcome to poke around these and see what they’re doing before moving on. // This is a string indicating what shipping method we're going to use. Technically this should be split into it's own table for shipping methods, but for now it'll do. // Timestamps are really useful for data monitoring. They let you see the created_at and updated_at times for the record. // How many of this item are in this order? // This is a Forigin Key to the variants table, allowing us to know which of our item variants we want to provide in the order. // an item can have an SKU. This is a unique id and is great for a primary key, but there are ongoing debates in the MySQL community over this being a good or bad idea. Auto incrementing fields are easier to index after all. If you got anything else, including an error, then you need to take a look at what it’s telling you and correct it before continuing. Optionally at this point you can open up a database editor and check it’s all there as you expected it to be. Since I’m calling this another milestone in the project, I’m also going to commit my changes. git add -A git commit -m "initial database migrations created"
git commit -m "initial database migrations created"
functions in our migration files – that’s when these are called) or refresh, which resets then re-migrates the tables. Take a look at the Laravel docs on migrations for more information.
. It might be worth adding some for our tables, but right now I won’t. You can always research if you’re interested in the subject. In order to talk to the database in Laravel we will be using a model. Once again, if you want details of MVC frameworks in general, or what models do in Laravel I encourage you to do your own research. I can’t cover everything here! What we will do is drop back to the command line and create some models for our new tables. I follow the convention of models being named as plural – so “order” is “orders”. This is preference and you don’t need to follow it if you don’t want to. php artisan make:model Orders # Model created successfully. php artisan make:model Items # Model created successfully. php artisan make:model Variants # Model created successfully. directory has files named the same as those listed on the command line arguments.Laravel uses Eloquent to mange database queries and relationships. Lets open them up one at a time and define some of these relationships between the tables. Take note, that because there’s one variant, and one order for one item, I’ve used singulars as the function names. On the orders model I’ve used a plural “items” as there are many items in an order. This is preference, and adjust as you see fit. We’ll see how these relationships benefit us later. For now, lets take a look at further work on the models. A model will use a table of the same name by default, find out more at the Laravel docs website. I’m also going to allow fillable fields using mass assignment. To do this in each of the models create an array of variables that you’ll allow to be fillable. Lets add fillable column names to the other models. That’s us done playing with models right now. Save all that and lets add it to git. git add -A git commit -m "created models for orders, items and variants with fillable fields defined and relationships created"
git commit -m "created models for orders, items and variants with fillable fields defined and relationships created"